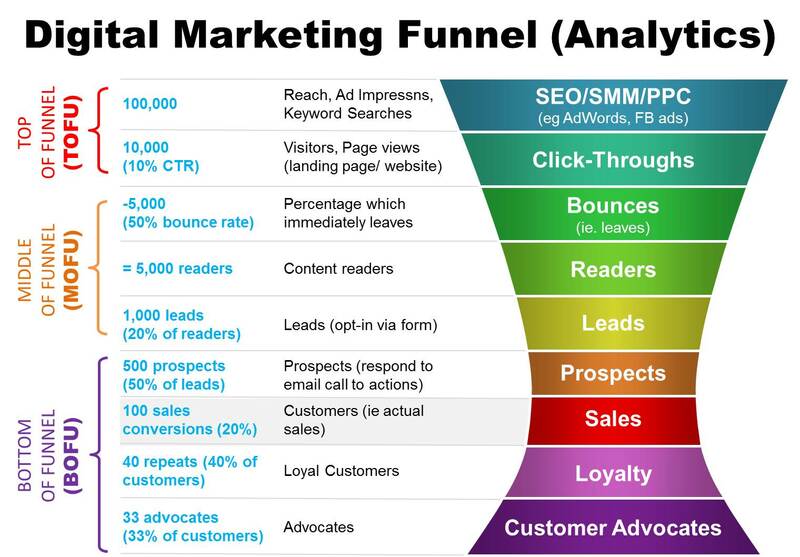 A marketing funnel is a way of representing the entire journey a person goes through before reaching a certain goal. The reason we call it a funnel, is because this is a graphical representation of a flow of people, with conversion drop-off at each point. The idea is that X number of people go in at the top, and much few number of people come out of the bottom. The journey, commonly known as the buyer journey, is defined by a series of actions, and the end goal is often the prospect becoming a customer. However, a sale is not always the goal of a funnel. Facebook have a marketing funnel with the end goal of signing up for a free account. Bloggers have a funnel for a reader subscribing to their blog. It’s important to understand that funnels exist everywhere. Not just in the in the digital marketing realm. Understanding how funnels work in the various different contexts is key to applying them in your marketing plans. 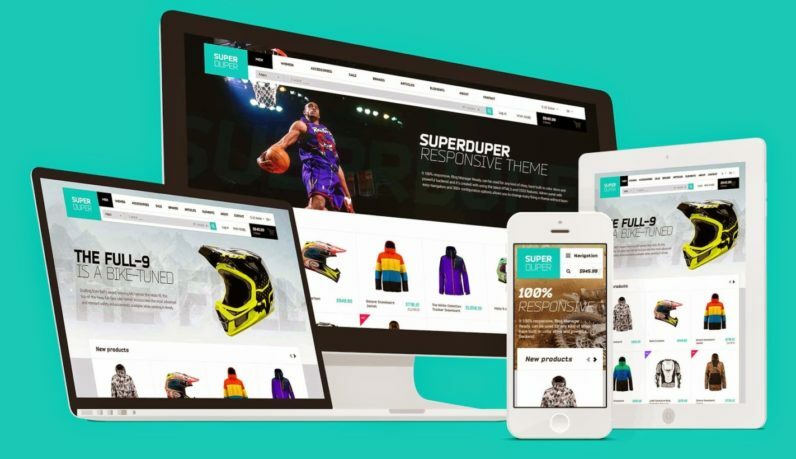 Let’s consider the various funnel stages of an e-commerce website. First of all, identify the different goals of this customer journey. Then, think of the various actions that lead to these goals. The buyer’s journey would look something like this. For the website of a Saas application, it is also very important to establish a funnel. Keep in mind though, the buyer’s journey differs from product to product. From there, the sale is closed outside of the website, by email, call, or meeting for example. Its important to consider this funnel when embarking on a new website design. We’ve discussed the various stages of the consumer journey. A big mistake we see most marketers make, is that they only focus on the bottom of the funnel. This is based on assumption that the potential customer already knows what they want, and you just need to ‘sell’ to them so that they chose your partiular product or service instead of one of your competitors’. Instead you need to have a marketing strategy that covers all stages of your funnel. Now that you have determined all of the various actions and goals, you can divide everything into funnel stages. This stage is essentially about attracting traffic to your website and your content pages. The more relevant content you publish the more keywords you rank for, and the better-performing paid campaigns you have, are all factors that contribute to how wide your funnel is. The reason we call it the awareness stage is not just because it’s raising awareness of your business, but it also makes the person aware of their specific goal or need that they need a solution for. Companies with great diversity of top-of-the-funnel content often attract a lot of traffic. The middle of the funnel is know as the consideration stage, as this is the stage in between when the person is aware of their particular need, and when they have made a decision to close. This is when your offering is identified as a potential solution to their particular need. For example, if you look at a sales funnel of a financial planning company, the Awareness Stage is when the person becomes aware of the need for a financially safe future, and the Consideration Stage is when they identify getting a financial planner as a solution. The bottom of the funnel, also know as the decision stage, is the last point before sale. As it’s name suggest, this is when the prospect already knows what they want, they are just deciding who to buy it from. Google Adwords is an example of one lead generation tactic that targets people at the bottom of the funnel, as it targets people based an search query related to the compan’y solution. Customer Service has increasingly become such a big focus for most businesses, simply because of the power of customer referrals. Having customers that add more traffic to your funnel will exponentially grow your business, and reduce your Cost-per-acquisition, because clients you have spent marketing dollars acquiring, are now doing a bit part of the sale for you. The bottom line here is, don’t focus all of your attention only on revenue-generating part of the business like sales and marketing. Invest a considerable amount of your resources on customer service, and getting customer feedback. Subscribers are opted-in contacts in your database. They are as high up in the funnel as it gets for a known contact. They have not yet demonstrated and qualification as a lead, and they will need to be nurtured into becoming a lead. A lead is a subscriber that has performed any lead-qualification action, like an submitting a form for a top-of-the-funnel conversion asset, like an e-book or brochure. Once a subscriber changes to a a lead, they generally move from the top to the middle of the funnel. A Marketing qualified is a lead that has engaged more deeply than a lead, and has submitted forms for middle or bottom-of-the-funnel conversions assets that qualify them further as sales-ready, such as pricing info and product guides. This moves them from middle to bottom of the funnel. Sales-qualified leads are leads that have shown a genuinely high interest in the product/service, and the sales department has identified that it is worth persuing them with direct sales activity to become a customer. An opportunity is one step after SQL, when there is an actual deal being discussed, with real intent to buy. Once the deal is closed, the lifecycle stage is now changed to customer. Most companies stop here, in terms of lifecycle progression, however the next lifecycle stage, Evangelist, is very important. We spoke earlier in this article about the importance of a high level of customer service, to encourage existing clients to become promoters of your business. Evangelist is the last lifecycle stage, and they make a real impact on your business as they keep pushing more people into the top of the funnel. Now that you have defined your funnel stages, and the corresponding lifecycle stages, you will need to measure conversion throughout the funnel. This is crucial for identifying bottlenecks in the funnel, and allows you to measure how effective your CRO (concersion rate optimization) is. Basically, any trackable action that has an impact on the probability of closing, can be defined as a conversion goal. There are multiple ways to approach measuring funnels. There are multiple types of metrics, that can be mixed, matched and combined. The first type of metric is volume-based metrics. Here are some examples of these metrics, sorted by the relevant funnel stage. Once your funnel is clearly mapped out, and you are measuring the conversion rate between each stage of the funnel, you can start to identify where the bottlenecks are you in your funnel. Most inexperienced marketers tend to put all of their focus into pushing more and more contacts into the top of their funnel, rather than optimizing conversion rates throughout the conversion-path. Think about it. If you are currently getting 1,000 website visits a months, and your conversion rate is only 1%, that means you’re only getting 10 leads a month. If you were to now focus all of your marketing efforts on increasing website visits by 20%, which mean 1,200 visits per month, you would still only get 12 leads per month. If however you were also focused on optimizing all of your forms, CTAs, website copy, etc… to increase you conversion rate to 5%, then those same 1,000 website visitors you’re currently getting, will convert into 50 leads. In digital marketing, a clearly mapped-out, measurable marketing funnel is everything. This should be the first thing you identify when creating your digital strategy, and it should be what you constantly monitor throughout. Constantly refer to your funnel dashboard to ensure that are no bottlenecks disrupting your conversion path, and make sure your marketing resources are evenly dedicated across all stages of the funnel to maximize the impact of your overall strategy.